I mentioned in my last post that I’ve been playing with some new fabric from Riley Blake called Wiltshire Daisy by Carina Gardner. It’s such a pretty palette for spring, I decided that I would make some spring-time accessories and decorations. This project was originally written for the Riley Blake Design Team. Click here for the full Fabric Basket Tutorial. And what is a basket without eggs this time of year? 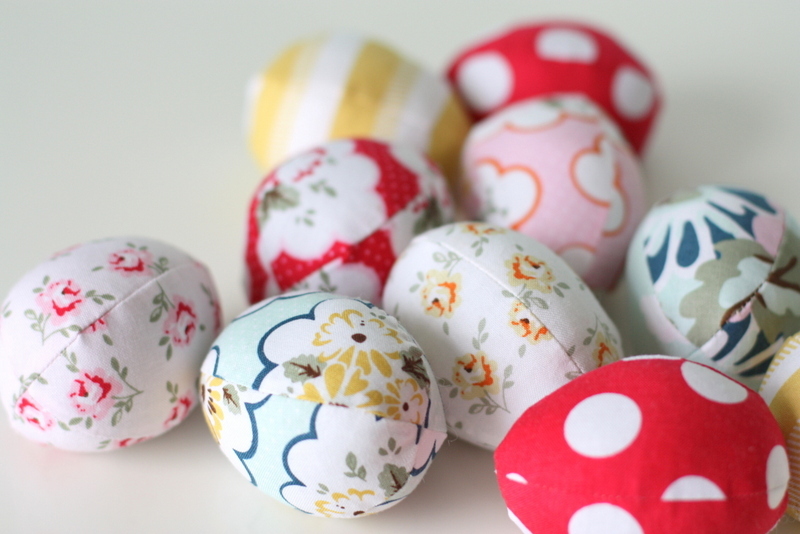 So I used more of the prints from the collection to make a variety of fabric eggs. 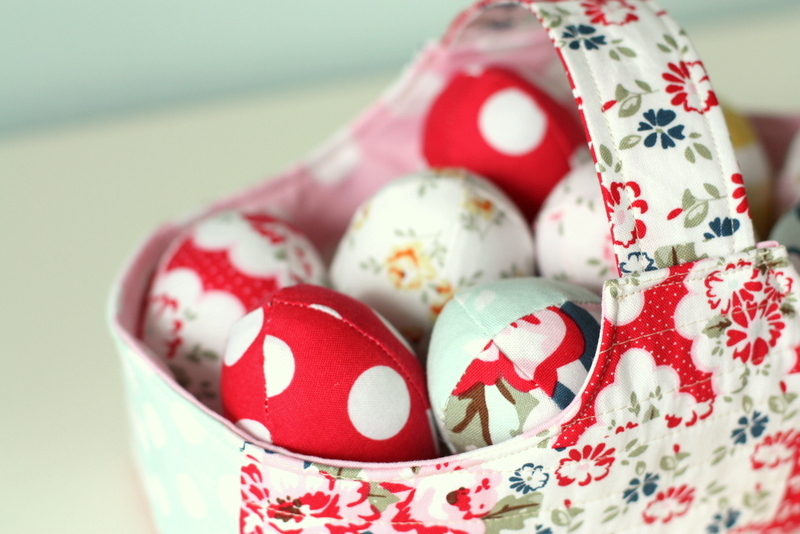 For these eggs I used this great fabric egg tutorial and pattern by Retro Mama. I have looked at this pattern and idea for year and finally got around to giving it a try. It’s kind of addicting! It’s hard to believe that March is nearly over and Easter is almost here. It’s one of my favorite holidays, so no complaints here! Wiltshire Daisy also comes with a CUTE printed panel doll outfit for your favorite 18″ (American Girl-type) doll. Look at this cute tutorial by Girl Inspired! Wiltshire Daisy is arriving in shops now. Online it is available from the Fabricworm, and precuts available from Southern Fabrics. Perfect and such pretty fabrics. Going over to look at the tutorial. Thanks Amy! Unfortunately, they don’t seem to have published the basket tutorial yet? Sorry for the delay – I just contacted them. Hopefully up shortly! 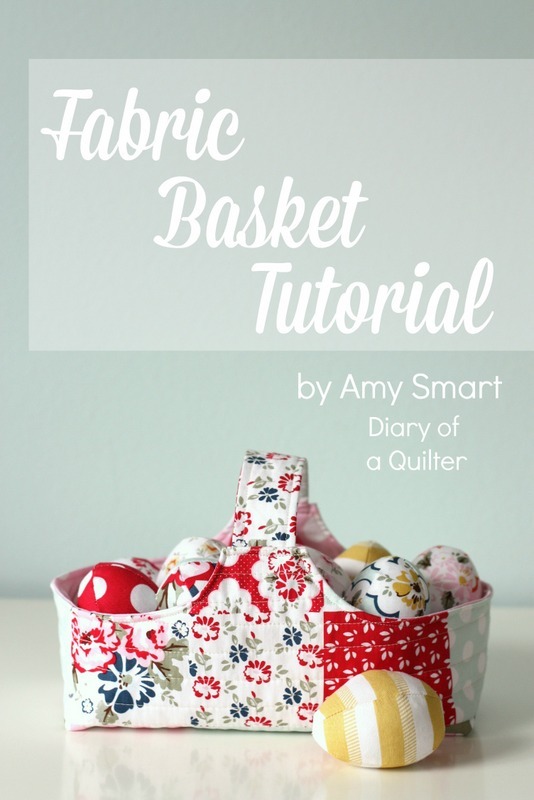 Thank you for this versatile and CUTE Basket Tutorial, Amy! i LOVE THIS BASKET. i WOULD LIKE TO MAKE A COUPLE, BUT i CAN’T SEEM TO GET THE TEMPLATE. ANY IDEAS? Hmm. I’ll try emailing the link to the pattern template to you directly. Let me know if it still doesn’t work. Omg I just ordered fat quarter bundle of this fabric. Well now I know what I’m doing with it! Hey Amy, im leaving comments everywhere hoping you get one of them. Printed the template and there is no notch at the bottom and the instruction don’t explain. From looking at the pictures I am guessing a 2″ notch is required, is that right? Hi Amy, I don’t know if you monitor the comments on Riley Blake. I’m guessing, judging by your cutting mat, that we should cut a 2 inch square away from the corners? Love the shape of this basket! I didn’t need a basket so I enlarged the pattern to make a grocery bag. Super cute basket! Thanks for the tutorial! Amy do you really like that blue rotary cutter ?? Dont you find it rather flimsy or unstable ? Yes. I love that rotary cutter. It’s an OLFA which I find are usually really sturdy. made one of these using old quilts that were my Grandmothers, too worn to use but too sentimental to throw away. That is such a great idea. I’m sure it’s so sweet.